How does the pastor come up with sermon topics? Good question. We could spend a lot of time talking about that. Maybe we will someday. For now let me share that the next series at First Baptist has been inspired by a book I have been reading this summer. Early on he talks about the many different ways people seek God. If you asked twenty people to share about their spiritual journey you would hear twenty unique, sacred, stories. While each of our stories, or journeys, may be different there are six common pathways that shape our relationship (or lack of) with God. 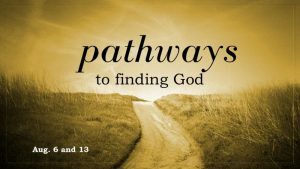 For these two Sundays we will explore these six pathways looking at the benefits and pitfalls of each. For those on the Pathway of Belief they cannot remember a time when they did not believe in God. Faith has always been an important part of their life and it provides a framework for how they view the world. People traveling the Path of Independence have made a conscious decision to separate themselves from organized religion yet still believe in God. They may find church boring, irrelevant, or maybe they were hurt by past experiences within the church. While they have walked away from the institution they still pursue a deepening relationship with God. 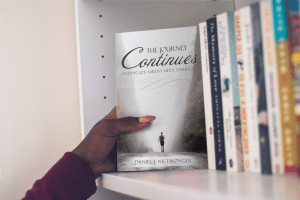 Traveling the Path of Disbelief individuals have walked away from the church and have come to the conclusion that God may not, does not, or cannot exist. People on this pathway are skilled at detecting hypocrisy amongst those who call themselves followers of Jesus. The Path of Return is one that many people visit at some time in their lives. Having drifted away from the church, having grown distant in their relationship with God something happens which draws them back. Maybe it is a life crisis (mourning the loss of a loved one) or a time of celebration (the birth of a child), whatever the reason they feel compelled to return and explore church and faith. Many people have traveled the Path of Exploration. On this path individuals find themselves searching for a religion that “fits” them. They remain open to just about anything and are willing to explore different faiths, denominations and practices; picking and choosing what works for them. Our last path, the Path of Confusion, is one that finds its way into just about every other pathway at some point in our journey. On this pathway there are times where we feel close to God, at others God seems extremely distant. Faith appears to be a real and vital part of our life one moment…the next we question whether pursuing a deepening relationship with God is worth our effort. All of these pathways are “normal”. God works through each of them to draw us closer to Him if we continually seek Him. This series runs August 6, 13. Service starts at 11:00. Hope you can join us.